kaifeng sida company is one of outstanding companies to produce cassava starch machinery. The cassava starch machinery includes dry sieve, paddle washing machine, cutting machine, rasper, centrifuge sieve, fine fiber sieve, disc separator, hydrocyclone unit, peeler centrifuge, flash dryer, cassava starch sieving machine and automatic packing machine. Dry sieve: dry sieve will rotate its inner spirals to remove some impurities and peels of cassava. This part will guarantee the high quality of cassava starch. It's worth to tell you that our cassava starch machinery won't destroy the cassava body in this cleaning process, keep the starch yield. Paddle washing machine: this machine is a different washing machine compared with potato starch washing process. It adopts counter current washing principle to make raw material flows in the converse direction against water. 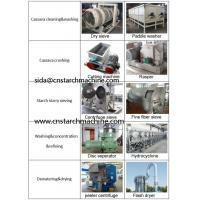 In cassava starch machinery, the two are designed according to the requirements of local clients. Cassava cutting machine: used to cut cassava into pieces, convenient for further crushing. Cassava rasper: rasper can crush cassava with high extraction rate. rasper has features of modern design, compact structure, high speed and high rasping coefficient. In cassava starch machinery produced by other countries, hammer mill will be used, but the machine has lower extraction rate. Our cassava starch machinery make the starch extraction rate more than 94%. Centrifuge sieve: The machine can extract cassava starch, this step is a key part in cassava starch machinery, used to remove fibers out of starch slurry. 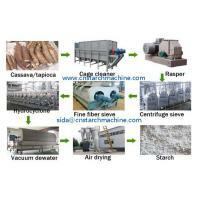 Fine fiber sieve: The machine remove small fiber which can not be separated by centrifuge sieve. After this machine, cassava starch will become purer. Our cassava starch machinery in this section has front and back washing system, which can wash the mesh so as to guarantee the normal operation. Disc separator: the machine is used to separate protein, cell liquid out of slurry, and it can be used for enrichment and purification of starch slurry. Usually it is matched with hydrocyclone to concentrate and wash cassava starch. Hydrocyclone unit: in the cassava starch machinery, hydrocyclone is used to remove fibre, protein and cell sap out of starch milk to concentrate and delicate scrubbing starch milk. Usually hydrocyclone unit includes concentrating, recovering and washing. After processed by this section, the cassava starch milk will be pure enough. Peeler centrifuge: this cassava starch machinery is used to dehydrate cassava starch, has siphon and adopts centrifugal force, so cassava starch can be dewatering with high efficiency. Flash dryer: the machine has special heating system and cooling system. Besides, the machine adopts negative pressure system which can guarantee clean working environment. It is also an effective dryer of cassava starch machinery. 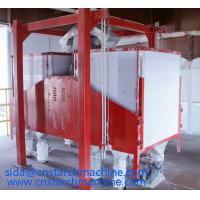 Starch sieving machine: the starch after drying can be sieved by starch sieving machine in a short time. Automatic packing machine: the packing can save a lot of labor, and the packing step can be finished by 2-3 persons. The machinery above all are cassava starch machinery. They all have high quality and designed with advanced technology from kaifeng sida Company. Starch is an important raw material for a range of industries including textile, paper, adhesive, cosmetic, pharmaceutical and food.The demand for starch usually increases as countries become more and more developed. For instance about 34 million tones of starch was traded worldwide in 1993. 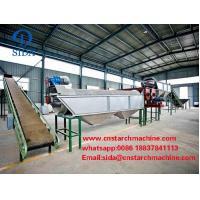 Since starch has many applications, so cassava starch is more and more popular in many countries, cassava starch processing also haven been an important way to improve the economic income of cassava planting area, if you are finding the cassava starch processing machinery, kaifeng sida Company will by you best choice.